All-female Irish-American group Cherish the Ladies was formed in 1985 in New York. They take the name "Cherish The Ladies" from a traditional Irish jig. At one time the members of the group consisted of Joanie Madden (flute, whistle and harmony vocals), Mary Coogan(guitar, banjo, mandolin), Heidi Talbot (lead vocal, bodhran), Mirella Murray (accordion), Roisín Dillon (fiddle) and Kathleen Boyle (piano). 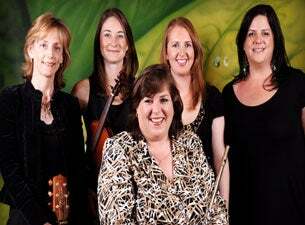 The group has been a launchpad for many of the top female musicians in Celtic music including; Eileen Ivers, Winifred Horan (of Solas), Cathie Ryan, Heidi Talbot, and Liz Carroll. Read more about Cherish The Ladies on Last.fm. Here are some industry leading presale databases we recommend you use if you're in need of a Cherish the Ladies presale password to buy early tickets to see Cherish the Ladies performing live. Getting your tickets early is a great way to get great seating and secure your tickets before they sell out during the public onsale.